For those waiting for Spike Lee to make another feature film, your time has come. After four years he's back with Red Hook Summer, about a middle-class boy from Atlanta who is sent to Red Hook in Brooklyn, N.Y., to spend the summer with his minister grandfather in a housing project. It premiered at the 2012 Sundance Film Festival to mixed reviews. Lee co-wrote, directed and self-financed the independent film for less than $1 million, he says. He also reprised his role as Mookie from Do the Right Thing but makes it clear that this film is not a sequel. Lee talked to The Root about the movie, that million-dollar Obama fundraiser at his house and, of course, Tyler Perry. The Root: Why did you decide to do a completely independent film without studio involvement or money? 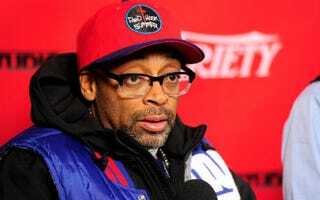 Spike Lee: I'm an independent filmmaker. I've never considered myself a Hollywood filmmaker. I never left independent film. I wanted to make a feature film and hadn't done one in four years. I was tired of people saying, "Spike, when's your next film coming out?" We had to get a film made. TR: Where did the idea for Red Hook Summer come from? SL: [Co-writer] James McBride and I were having breakfast one Saturday morning at Beyond Coffee Shop on 61st Street and Madison Avenue, and we were talking about the state of black cinema and said we got to do a film. I had just bought a camera and said we got to do it. Self-determination, self-reliance. TR: The film tells a powerful story and tackles issues some might find surprising. What does it mean at this point in your life and career to create something like this? SL: We were making films like that since She's Gotta Have It and Do the Right Thing. A lot of the films I've done, there is social commentary, and this film is no different than the others. James and I live in the world today, so we wanted to do a film that speaks to where we are in this time and space. TR: The movie includes dialogue questioning what President Obama has done for black people, yet you just held a big-ticket fundraiser for him. What's that all about? SL: I support my wife, and I held a fundraiser, a dinner, at our house last Thursday. It raised $1.6 million for his campaign. We didn't plan it — we got the call from the White House, so it was a great honor. So when my wife introduced President Obama, she said, and I paraphrase, "Some of you might be wondering why Spike is doing this, because he's been a little critical of the president, but I'm like the president — we don't like all your movies either," so it was all love. And then Barack said, "Bamboozled? What were you thinking?" So here's the thing about black people, and this has to go to the heart of Tyler Perry: No one is above being criticized, and especially if criticism comes from the correct space. The stuff I said about President Obama is not because I am being hateful. It's just [that there are things I disagree] with. I'm still supporting him, and the same goes for Tyler Perry. I don't want to hear this stuff that whoever we are, we can't constructively criticize. We have to get out of that mindset. Anything I said, it's not out of hatred, no matter who it was [about].